As we approach the end of this decade, not only is the world going digital, but technology is getting closer to us. Devices are getting smarter and among these smart devices, wearable devices have made a lot of progress. Smartwatches, in particular, are the ones which have impressed the most. The best of these watches allow you to do pretty much everything that you can do on your phone without even having to look much at your phone. They bring the power of a smartphone on your wrist and combine it with the elegance of a watch. Technology makes life easy and smartwatches are a good example. Today, you can easily listen to your favorite music, send or receive messages and calls, and even start video chats with your friends using nothing but a watch. Soon, there might be a time when you don’t even need your phone for basic tasks anymore as this new device will satisfy all your needs. Here, we attempt to curate the list which will not only prove to be a great companion to your smartphone but also improve the quality of your day-to-day life. These are the 10 best smartwatches that you must consider if you are looking forward to buying a one. We begin our list with Samsung’s Gear S3 Classic – which is one of the most efficient and best premium smartwatches in the markets. It came out in 2017 and continues to be Samsung’s latest model. 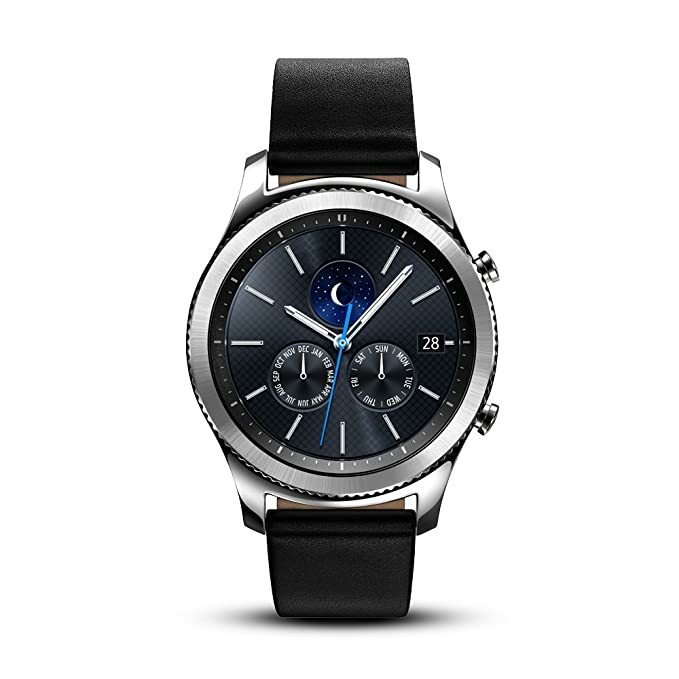 This third-generation Samsung device is among the top watches for Android which also functions well along with iOS devices. Samsung’s Gear S3 Classic is a durable device which offers a number of features such as a built-in GPS, along with long-lasting battery life. We can, in fact, go out on a limb to say that Samsung Gear S3 Classic offers one of the best battery life as compared to its competitors. The app support here is pretty impressive, especially for Android users. Bonus points to those who are using Samsung devices such as the Samsung Galaxy S10 or the Samsung Galaxy S8, S9, etc. It also offers support for customization, allowing the users to build their custom watch face and choose a band of their liking to get the perfect feeling of ‘owning’ the product. These customization features make it one of the choices for women as well as men ensuring that they can tweak the look as per their needs. The bezels can be rotated in order to access certain apps and perform pre-set tasks. This is another cool feature of the Samsung Gear S3 Classic. 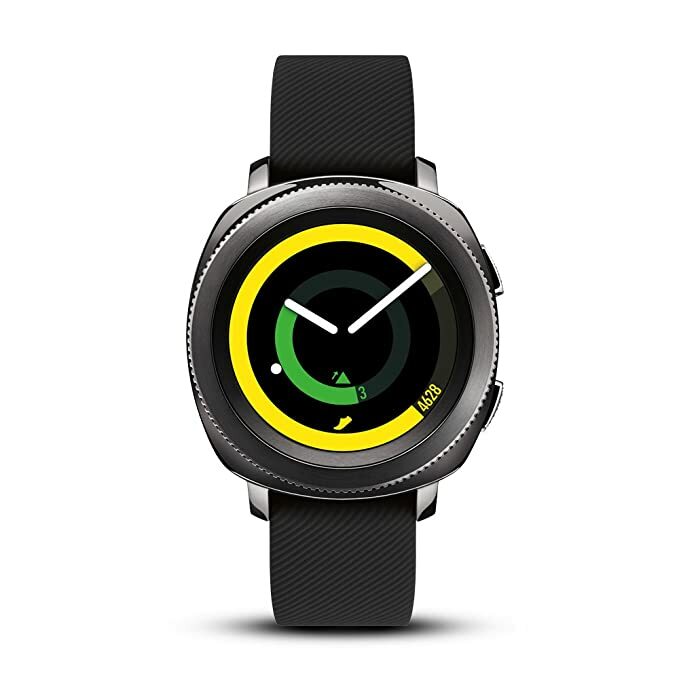 In addition to that, the watch also gears up as a smart health tracker, teaming up with the S-Health app of Samsung. What further accounts for this 2017 model that is still popular in 2019 is the fact that it offers not only great tech-specs and features but also comes with a great look and feel to it. The Gear S3 Classic is for those who want to use it for office to excel at work and life. Moreover, the watch has the look and feel of a premium watch which goes well with any attire, particularly built keeping formal wear in mind. 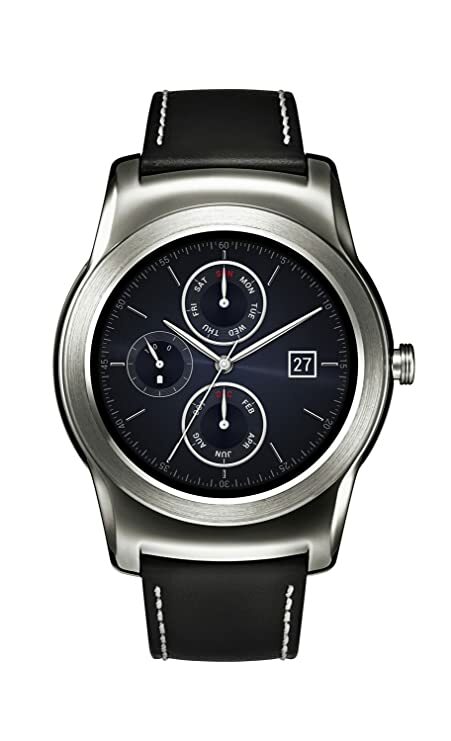 The LG W150 Urbane is considered to be among the top smartwatches below $300. It is the perfect device for those who want to get a smartwatch but don’t want to shell out too much for it. It offers a mix of elegance as well as technology. Apart from being a smartwatch which offers the users with regular functions such as notifications and basic smartphone-connected features, the LG W150 Urbane also doubles up as a health monitor. It comes with a heart rate monitor and can track your movements. The watch provides real-time health and fitness related information! It is one of the top smartwatches for android users as it can work with almost any smartphone running Android 4.3 or above. The watch offers a 1.3 inched P-OLED display. It comes with a full-metal body and is protected by Gorilla Glass 3. The watch weighs about 3.2 ounces, making it light in weight and a comfortable accessory. One of the best things about the LG W150 Urabne is the fact that you can control a lot of its features using just your voice. You can give voice commands to it, send text messages or check the score of an ongoing match, etc. The display of the watch goes dark when not in use which ensures that the battery life remains long lasting. The LG W150 Urbane came out four years ago, in the summer of 2015. However, the watch continues to be one of the most popular smartwatches in the markets, and a good alternative for those who are looking forward to buy a budget smartwatch instead of a premium one. Lightweight and good-looking, this is a watch for the outdoorsy as well as the corporate person. 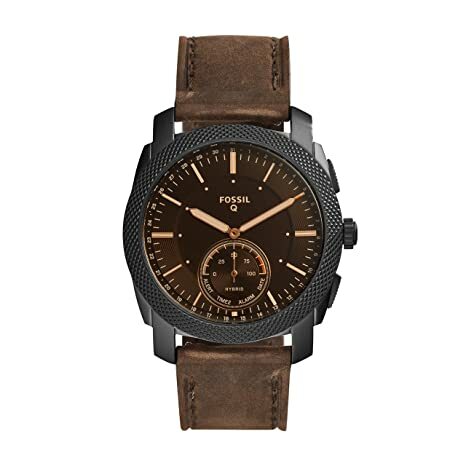 Fossil is among the most popular names when it comes to traditional watchmakers. The brand is known for its efficient watches. For some time, Fossil too, has been releasing smartwatches and the Fossil Q is an outstanding example of their finesse. It is a hybrid watch, offering the perfect balance between a traditional watch and a smartwatch. One of the best things about Fossil Q is that it offers some of the core features as per the latest trend in the markets – it allows you to control your music streaming and even track your movement! The watch allows you to count your footsteps as well as measure things such as your commute time, etc at the push of a button! You can even assign the buttons a specific function. For instance, pressing the button on your watch would take a picture on your smartphone. Moreover, the watch offers you notifications every time your phone gets a call or a message ensuring that you do not miss them. Another great feature about the Fossil Q is the fact that you do not need to charge it. It runs on a battery that lasts 6 months and connects to your phone via Bluetooth. You can simply replace the battery and get another six months. Fossil Q is one of the top smartwatches under $200. Another interesting feature of this watch is that it automatically adjusts the time zones based on where you are – which means you do not have to take the trouble to customize the time based on your location. This is a fairly recent release from the company as the watch was released last year. The dial is good sized and allows you to glance at the time comfortably. You can also customize the straps of the watch based on your need. Given that it offers a rugged look, this one is more popular among males. Motorola’s Moto 360 first came out in 2015 but can go head to head with any smartwatch released thereafter. 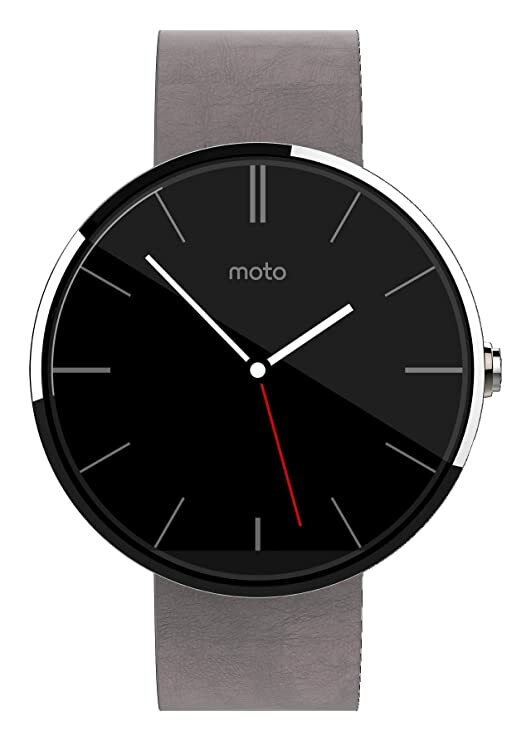 Moto 360 is widely popular for its affordable price. Not only is it one of the best looking smartwatches but also one of the best-performing ones. The fact that it continues to be a hot seller in the markets even four years after its launch is a testament to its performance. The Moto 360 offers all the features you’d want from your smartwatch. It acts as a health and fitness tracker as well as a companion device to your smartphone. It provides notifications and alerts from your smartphone and also helps you control certain aspects of your phone. You can connect it with any Android 4.3 smartphone or higher. Another great feature of the Moto 360 is the fact that it can be controlled by voice commands. You can use the voice commands to send messages, check the weather and much more. The watch also supports gestures, making it a true ‘smart’ watch. Despite the fact that it is a 2015 model, it can support a large number of Android apps on the watch itself. Another cool yet quirky feature of this smart device is that it allows you to draw emojis and directly send them to people. This makes it one of the top choices for kids as well. The watch offers a large dial, measuring in at 1.56 inches. It offers a 320mAh battery, along with 4GB of internal storage along with 512 MB of RAM. These are some statistics which have proven to stand the test of time resulting in the success of this watch for so many years! Samsung’s second S3 model here, the Samsung Gear S3 Frontier is the most convenient smartwatch for adventure lovers. Those who like being outdoors – it is for those who travel and trek and for those who seek a thrill in life. While the S3 Classic is more about elegance and power, the Samsung Gear S3 Frontier is all about the thrill-seekers. 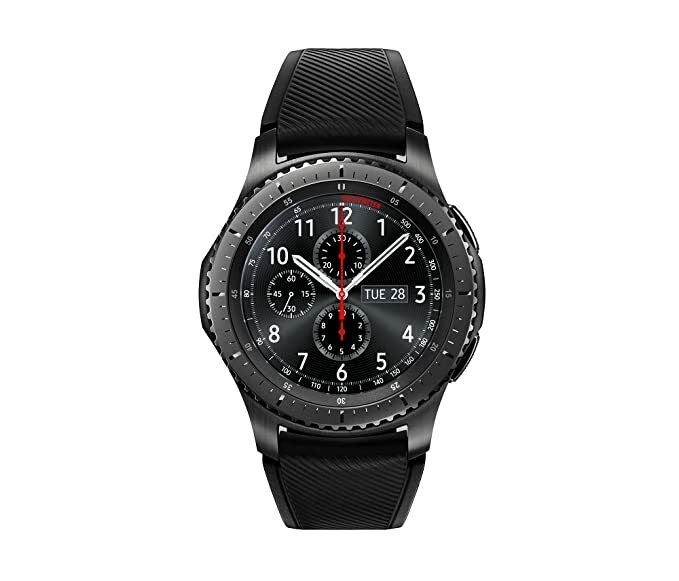 Priced in at just above $200, the Samsung Gear S3 Frontier is resistant to water and dust, as well as to extreme temperatures! The watch can also survive drops and falls. Furthermore, it comes with a strong battery life which ensures you do not need to charge your battery in the middle of an adventure! The watch has a rugged look to it, and can be paired with Android as well as iOS. In fact, it is one of the best choices for iOS users. This watch allows you to do everything that a smartwatch should. It allows you to read and send text messages, view notifications, receive and make calls (thanks to the built-in speaker and microphone), run apps, etc. Moreover, this watch also comes with GPS functionalities which are critical for those who like being outdoors and on adventures and travels. The steel bezel of the watch can be rotated to access applications and notifications. Another great benefit of the Samsung Galaxy S3 Frontier is that it comes with a number of health-related functions such as heart rate monitoring and tracking footsteps, etc. This ensures that all your health data is constantly monitored. This is one of the best budget smartwatches which can be customized as per your needs. You can swap the bands and change the watch face as per your likings. While this watch supports Android 4.4 and above devices, it is best suited when paired with Samsung Galaxy S9 or Samsung Galaxy S10 – Samsung’s latest premium smartphones. Pebble is among the most popular names when it comes to smartwatches. The company has been a pioneer in this field and some of their smartwatches continue to be in trend years after their original release. Pebble Time Round is a shining example of that. It is one of the lightest and thinnest ones. 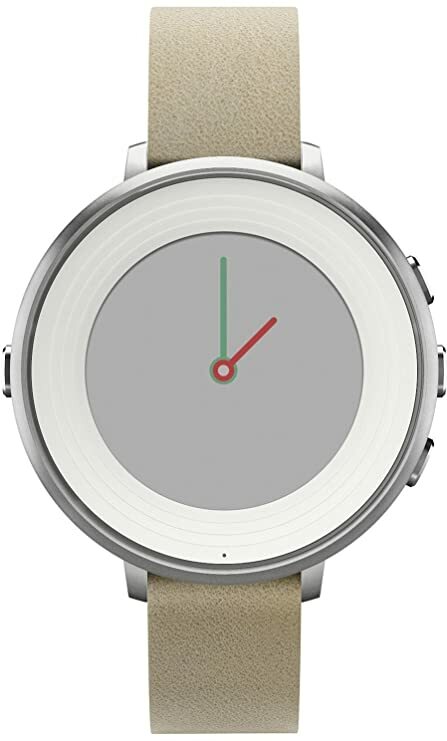 Pebble Time Round offers a large, 1.6 inched display. The watch comes with a number of health and fitness-oriented features such as activity and sleep tracker. These generate daily reports as well as provide you with weekly information about your activity and sleep. The watch comes with a very minimal and clean design, making it quite unique and classy in terms of appearance. It supports iOS as well as Android smartphones. In addition to this, the Pebble Time Round is worthwhile for those who need a smart device at a low cost. It supports all the classic Pebble features such as timeline alerts, notifications and alarm support. The battery life of this watch is up to 2 days, which can be quick-charged when needed. You can also control your music, presentations, video playback and more using this watch. It is splashproof and offers several options for customization with the help of various watch faces that you can choose based on the mood and the occasion. The Pebble App store also supports a large number of apps that you can download and install. It is one of the best budget smartwatches – priced in at just $129. While you can’t get any good ones under $100, this is the closest that gets to offering a good price-quality combination. Though if you are looking for best smartwatches under $100, you can look up refurbished pebble time round watches. Perhaps the best choice in the budget/low-price category. Timeline feature shows you all the information at one glance. Long battery life and quick-charging. Samsung Gear Sport, as the name suggests, is specifically built for those who are active in sports. The watch is designed in such a way that it can handle the needs of those involved in various sports. However, even if you are not into sports/athletics much, you can still check this out as it is one of the best smartwatches under $200. The Samsung Gear Sport is water resistant up to 50 meters/5ATM. This makes it best suited for those who go swimming. Not only can they record their swimming movements and the calories burnt, etc. but they do not even have to worry about taking the watch in the water with them! The watch also provides detailed health and fitness data including but not limited to fitness tracking and calorie counts. Moreover, it also supports personal trainer apps, helping you work out. It comes with a large, 1.69-inch display. In addition to the sports-specific features, the Samsung Gear Sport also performs most functions that a regular smartwatch performs. It allows the users to pick and make phone calls, read and send text messages, control connected devices as well as make contactless payments using Samsung Pay. Another interesting feature of this Samsung Gear Sport is that it supports a battery life of up to 7 days: quite impressive for a smartwatch. This is compatible with both iOS and Android phones. However, the peak performance comes when paired along with Samsung smartphones such as the Samsung Galaxy S10 or with other major smartphones such as the Google Pixel devices. Best suited for those into sports. Offers a massive 7-day battery life. Heart rate sensor tends to provide inaccurate information at times. You would require Bluetooth headphones to make/receive calls as there are no built-in speakers. The settings menu is very unorganized. The Apple Watch is one of the most popular and best premium smartwatches in the markets. Buying this watch is quite an expensive affair. However, it provides users with some of the best features and services. The latest Apple Watch (Series 4) comes with GPS as well as cellular support. This watch offers a display area of up to 977 sq mm, making it one of the biggest smartwatch displays. The Apple Watch is powered by a 64-bit dual-core S4 processor. It comes with two heart sensors: one electrical and one optical. It also stresses on health and fitness and tracking and monitoring workout and health-related activities. It comes with a Yoga mode as well as a hiking mode. Moreover, it also allows you to make and receive calls as well as text messages. You can also stream your Apple Music and Apple Podcasts right off the watch. The speaker is loud and impressive. The watch also supports Siri. In addition to the regular features, the Apple watch also notifies you from time to time when it spots irregularities in your health. For instance, if your idle heart rate suddenly begins to surge, your watch will alert you about it. Moreover, it can also detect a call and send an SOS message to emergency contacts. The Apple Watch is Swimproof, which ensures that you can take it along with you while you swim without having to worry about it getting damaged in the water. This watch runs on Apple’s WatchOS 5. In terms of battery life, the Apple Watch supports up to 18 hours of battery life a day. Basically, when you own the Apple Watch, you don’t even need to carry your phone as it performs every function that your phone can! Cellular support: you don’t need to carry your phone around anymore! 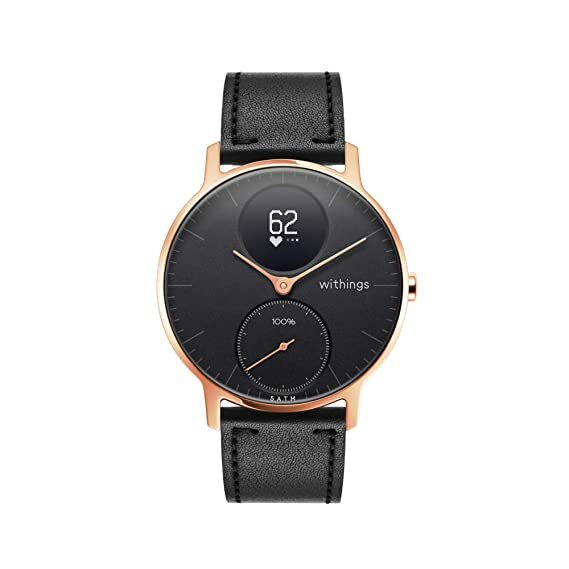 France-based consumer electronics giant Withings and Nokia teamed up to create the Steel HR in late 2017. It offers users with a number of interesting and smart features and focuses on the healthcare aspect of things. This works well with iOS and Android devices. The Withings Nokia Steel HR comes out with a connected GPS system, which allows the users to always be connected regardless of where they are. Along with basic navigation, it also provides you with insights on distance, elevation, and pace. Another cool feature of this watch is that it monitors your heart rate and fitness-related data. It comes with a health mate app which records your heart rate data continuously and creates a graph. It also shows your heart rate zones such as light, moderate, intense and peak. One of the most interesting features of the Withings Nokia Steel HR is the fact that the battery life of the watch can last for up to 25 days. Moreover, if you put it on the ‘power saving mode’ (where it just tracks activity and shows time), it could last you 45 days on a single charge. This watch is also designed in a way that you can take it for a swim or in the shower. It is water resistant up to 50m. Another benefit of this Withings Nokia Steel HR is that it offers you all your notifications on the screen. You get notified about calls, texts, events, and other app notifications on the watch screen. It also comes with Alexa integration, this means that you can directly give a voice command to the virtual assistant to get your activity stats of the day as well as for various other basic tasks. Sleep tracking is quite inaccurate. Workout mode does not provide customization. Supports only one alarm at a time. Michael Kors is a popular name in fashion and luxury products. The brand has a number of products such as handbags and shoes, but their watches are also quite a delight. Michael Kors Slim Runway is one of the best luxury watches for those looking to buying one. This watch comes with the class and the elegance of a high-end brand such as Michael Kors and offers all the latest and cutting-edge technological features that are expected from a ‘smart’ watch. Michael Kors Slim Runway works with iOS as well as Android devices, supporting Android 4.4 and above and iOS 8.1 and above. It is a hybrid smartwatch and the company promotes it as ‘an analog essential with a tech twist.’ The Michael Kors Slim Runway provides its users with all the essential features every smartwatch must: it displays notifications from your smartphone. It also allows the users to control the music, ring phone or click a picture! It also comes with activity tracking and sleep tracking features which have got your fitness covered! The watch auto-updates time and date based on your location and you can also view multiple time-zones on it. Moreover, it allows you to customize the buttons so you gain complete control over your smartwatch. Last but not the least, it comes with a replaceable battery that can last up to six months. You do not have to worry about charging the battery again and again. The band of this Michael Kors Slim Runway is made of stainless steel and gives it quite a classy look. The watch is also waterproof up to 30m (100ft) and can withstand general splashes and even a brief immersion in water. However, it is best advised not to take it for a swim or wear it while you bathe. Purchasing a smartwatch, on an average is a decision that will cost you between $200-$300. For premium ones, you might even end up shelling out as many as $400-$500. The most high-end of smartwatches can even cost you more than your phone (such as in the case of the latest-generation Apple watches). Hence, it is important to keep certain parameters in mind before you buy one. In this section, we take a closer look at why you need a smartwatch and what all do you need to consider before buying it. Before we get into things that you need to keep in mind before you buy a smartwatch, let us first look at why you need one in the first place. The biggest advantage of smartwatches is that they help you stay connected at all times. It organizes notifications in a way which will help you get ‘at-a-glance’ information about everything that’s happening. All your social media notifications, your text messages and call information can easily be viewed using such a watch. Some of them also allow you to use voice commands to control things. Moreover, trendy ones also allow you to make and answer calls and send text messages and reply directly via the watch! Hence, you are always connected. Another cool feature of you can get is that they double up as a fitness tracker. They usually come with fitness tracking solutions such as calorie counter, footstep counter, heart rate sensors and more. Certain sports-focused ones such as the Apple Watch and the Samsung Gear Sport are devices built for those interested in health and fitness. It also helps you exercise and prepare fitness routines for you based on the sport you do or the goals that you want to attain. Another really cool feature of smartwatches which make them a must-have in 2019 is the fact that they allow you to control your smartphone as well as other connected devices remotely. Most of them offer basic functions such as controlling the music playback, the volume of the sound, the ability to control slide shows, and much more. These features would typically require you to take out your phone and make adjustments, but with such watches, you can do that straight off your wrist! Furthermore, it also allows you to control connected devices nowadays, making them a must-have for anyone who uses smart-devices for their homes. Last but not the least, they are the perfect accessory. They double up as a travel companion, as a fitness tracker, as well as a fashion statement! Travelers love them as they come with built-in GPS system which can be pretty handy during Treks. Moreover, fitness trackers in them help ensure that you have all your health-related information in one place. In addition to that, the best smartwatches of 2019 also double up as a fashion accessory. They come with swappable bands and customizable watch faces which go with your style! Now that you know why you should be using a smartwatch, here’s a closer look at some things that you need to keep in mind before you get one. These are the parameters that you should consider before you buy the watch. Given that smartwatches tend to be a hefty investment, this checklist would help you make the best buying decision when it comes to buying the one for your needs. Will it Work With Your Phone? The first and foremost question, the most basic thing that you need to ask before you buy any smartwatch is: will it work with your phone. However, given that we are in 2019 the answer to this question by default should be yes in most cases. All the top smartwatches of 2019 work with all Android smartphones running Android 4.4 and above. This means that almost all Android phones of the past 6 years should be supported by them. However, you still need to check. Better be safe than sorry. Moreover, you need to ask this question specifically if you are not an Android user. If you are an iOS user, you need to make sure that the watch supports iOS devices. While most of the top tier smartwatches support iOS smartphones, there are some smartwatches which do not. Hence, this is critical to check out if your phone is supported. Sadly, if you are one of those people who is still using a phone running on the Windows 10 Mobile OS, you might be out of luck as there are hardly a few smartwatches in the market which support that OS. You might want to check out Microsoft Band for your use. After checking if your phone is compatible or not, the next question that comes to mind is the cost involved. The cost, in most cases, can be the make-or-break factor when it comes to the final purchase decision. Hence, you need to consider that as one of the strongest parameters here. While they are available in all prices ranging from $100 to $900, the good ones usually cost between $350-$450 while anything above that is a premium smartwatch. The lower you go in the price spectrum, the more likely is the chance that the manufacturer has reduced the price by trading it off with some feature. Hence, you need to check all the features it provides and ensure that the ones you need are there. There are some smartwatches (such as the Apple Watch) which almost cost as much as a new smartphone! These premium smartwatches are a hefty investment so you need to ensure that they fit in with all the parameters in this list. You can check all them and finally make a decision based on the cost vs performance scale by going through this checklist. While the commonly known saying is that ‘the brand does not matter, the performance matters’, it is untrue when it comes to buying smartwatches. While performance obviously matters, the brand does matter a lot too! Given that there are a large number of companies which are making smartwatches these days, one needs to make sure they are buying from the ones which have goodwill in the market. A number of Chinese smartwatches have started coming out in the markets priced in lower or at the same price as budget smartwatches. However, these watches might not provide the perfect experience which a known brand will provide. Before you buy from an unknown or a lesser-known brand, make sure that you are getting a product which is credible. Finally, another good reason to buy a smartwatch manufactured by a reputed brand such as Samsung, LG, Motorola (or other names on our list) is that they also fetch a good resale value. Once you have used the watch for some time and want to upgrade it, you can easily sell off these branded watches for a considerable price compared to non-branded ones. A critical thing to check is the design of the device. Is the smartwatch you are buying going well with your swagger? For example, if you are someone who attends conferences and meetings frequently, you would prefer a sober and classic watch over a rugged and fancy one. And on the converse, if you are an outdoorsy/adventure lover, you would rather prefer a rough and tough watch over a classy one. It is based on the design of the watch that you can also get swappable belts which you can match with the outfit that you are wearing. While people tend to say that judging a smartwatch by its looks is shallow, sometimes style is everything! Another thing about the design of the watch that you must keep in mind is: does this watch offer protection against water, dust, and weather? These are important as many smartwatches get damaged because of these reasons. Another core factor that you need to consider is the build quality. Now, this is a part of the design of the watch itself. Does the watch offer a strongly-built body? Or is it too brittle? Do you have to worry about keeping it safe and protected against bumps and scratches too much? Can this watch survive a fall or two? Especially for the adventure lovers and the athletes, this is a critical thing that you need to check. Another major design element that you need to keep in mind is the shape of the watch. Some people prefer a round dial, while there are others who prefer a square dial and then there are those who prefer a rectangular one. While most of them come with a round dial, there are some which can offer you with a differently shaped dial. Moreover, another key thing to notice here is the size of the display: is it too small? Are you comfortable with a small display – and on the converse, also make sure it is not too large which makes it uncomfortable to wear! Another thing that one needs to keep in mind is whether or not it comes with a built-in GPS. This is particularly of use to those who like to go out frequently or go on treks. A GPS is essential for you to stay updated with where you are. You can also use the GPS location to let your friends and family know where you are. Moreover, a smartwatch with a built-in GPS is also convenient while commuting to work. Instead of having to check your phone again and again, you can simply flick your wrist to see if you are on the right path and where should your next turn be. To add to that, a GPS-enabled watch also helps ensure that you can also map your running/jogging/cycling route. While most of them offer a built-in GPS nowadays, there are some which don’t. As mentioned before, some watchmakers part ways with some features to reduce the costs. This is the reason as to why a built-in GPS might be missing from some watches. So if you are keen on getting a smartwatch with a built-in GPS, make sure your watch has this feature. A critical feature which many people tend to overlook is that of the User Interface (UI) of the smartwatch. The watch that you buy needs to have such a UI which is clutter-free and pleasing to look at. While most of them support touch-screen functionalities, there are some which rely only on buttons. Moreover, some watches run on the Android Wear OS, others have their own operating system and store. Some of them have a neat user interface which also allows you to customize the UI based on your preferences. You can also use several watch faces which make the watch look better. Also, before you buy your smartwatch, check how it shows notifications – does it club them together? Does it show them app by app? Does it automatically remove the notifications after a while, etc. The UI is important and you must not overlook it! One more thing that you must consider is the calling features of the watch. Does your selected smartwatch allow you to make and receive calls straight off it? Can you talk directly over it or do you need Bluetooth equipment for communication? Moreover, also check if your smartwatch allows you to make video calls. Some smartwatches such as Samsung Gear Sport are top-of-the-line names but do not come with a speaker (to keep the watch waterproof). Hence, it is always good to check if the watch allows you to make calls. Almost all of them provide you with notifications about incoming calls and text messages but not all watches allow you to answer calls straight off the watch! Last but not the least, the latest trend is to make video calls using smartwatches! Hence, make sure that it supports video calling and has a camera if you want to make video calls off the watch. Waterproofing is a must-have on any smartwatch that you choose to buy! This is because water-related damage is usually the most common reason behind smartwatch troubles. Always ensure whether the smartwatch is fully water-proof or at least water-resistant/splash-resistant smartwatch or not. All three mean different things. A fully waterproof watch such as the Samsung Gear Sport or the Apple Watch can be taken to a swim with you. A water-resistant watch such as the Withings Nokia Steel HR can survive water but is not fully waterproof. Then there are splash proof watches such as the Pebble Time Round which can survive the occasional rain but would get damaged if immersed in water! The reason why waterproofing is a big problem in smartwatches is that waterproofing would usually require the speakers and mic to be removed. The watches that have this problem solved are usually priced higher. However, in the days to follow, more and more smartwatches will be waterproof, or at least more water resistant than what they are now. The band type and customization options are other major factors that many people look at before they buy their watch. These days brands allow the users to swap the bands and change them based on their mood and preference. 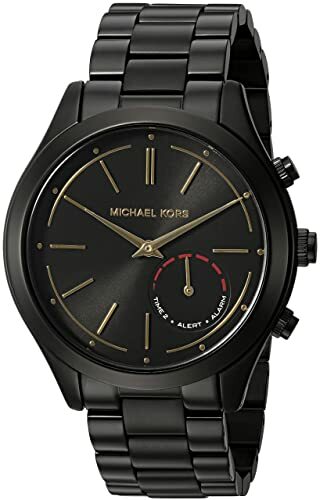 However, not all smartwatches allow this – in some cases (such as the Michael Kors Slim Runway) you are stuck with the regular steel band the watch comes with. The material of the band also matters. Do you want a steel band? Or are you happy with the default rubber band that the watch comes with? Would you rather have a leather band which would give your smartwatch a more classy look? Customizations are often important to users and watchmakers ensure that they get a lot of options. Talking of customization, most watches also offer you ‘watch-faces’ that go along with your band. When making the final decision, also go through the watch faces to ensure that your band and your watch-face go well with each other. In the past, users used to buy separate health tracking devices and fitness bands to get the readings of their health and fitness related data synced into their smartphone. However, with smartwatches, there no longer is a need to buy a separate fitness tracker! This is because most of them come with built-in health tracking solutions. Always look for what health-related features it has to offer before getting one. 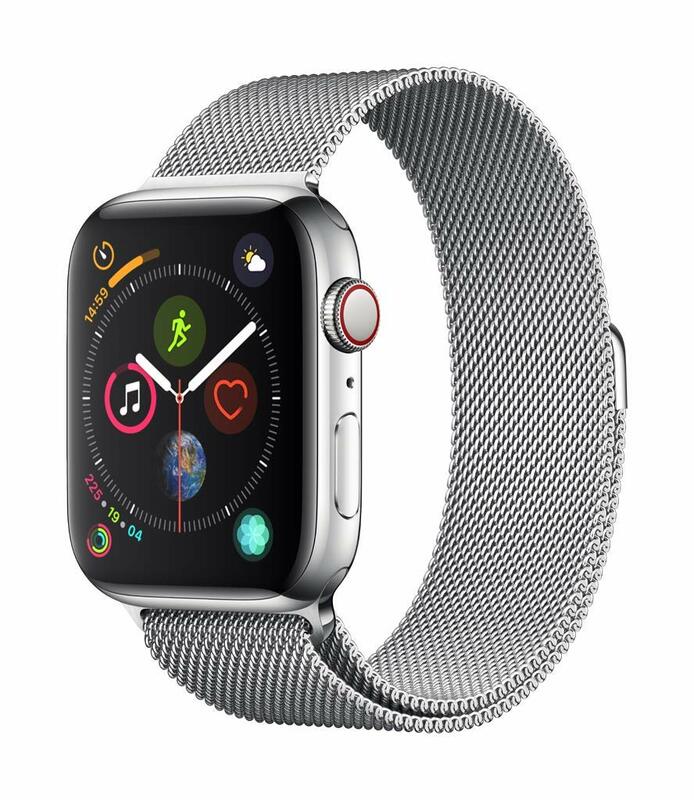 Moreover, if you are highly involved in health, fitness and sports-related activities, you might just want to check out certain smartwatches which are specifically built for that purpose such as the Samsung Gear Sport and the latest-generation Apple Watch. These watches come with specific health and fitness related focuses and even features which allow you to go for hikes and treks without any worry! The battery life is quite critical too! This is the last on our list but it is not the least by any shot. Battery life is very important and most modern-day smartwatches can function for a minimum of four to five days on a single charge and moderate use. Moreover, most of them also support quick-charging which ensures that the watch is fully charged in about 15 to 30 minutes of charging. Moreover, there are also smartwatches these days which support wireless charging. Battery life is important when it comes to those who require the watch for purposes such as trekking and traveling. They help you stay connected and get all the important notifications and information on your wrist. Hence, always check the battery life of your smartwatch before you purchase it. Now that you know how to buy the best smartwatch and which are the best smartwatches in 2019 – the final call is to choose one of the many names mentioned above. Now, this is usually the hardest part given how close the competition here is and how almost all these smartwatches devices perform so well. The differences between the aforementioned smartwatches are so minor that choosing one out of them becomes hard. Hence, the final call is upon you, the buyer. You must test the watch of your choice against the parameters mentioned above and see how they stand when compared to each other. Moreover, you also need to see what kind of a watch YOU want to buy – are you looking for a watch that is classy and formal? Or are you looking for a smartwatch that is outdoorsy and rugged? Or are you looking for the perfect companion for sports and fitness. What is the price that you are willing to pay? Which is your preferred brand – and what benefits are you getting from the smartwatch at the end of the day? Based on all these factors, you can choose the top smartwatch of 2019 for your needs. We hope this guide helped you in making the best decision! I’ve never bought a smartwatch. I have a question, is the tracking with these smartwatches really accurate? I heard a few friends saying that even if you move your hands like you move them while moving, these smartwatches will calculate it as a step. If they are really so inaccurate then what’s the point in investing $200-300 in them? Which one according to you is the most accurate model?